As a testament to their awesome control of public knowledge, the enemies of truth focus only on that which they would like for you to know. Whether in the area of politics, history, economics, or science, many books—especially those designed for academic use—are presumed to have been thoroughly evaluated by impartial scholars and fact checkers. But such is not the case. As we have now learned, misrepresentation is the rule, not the exception. 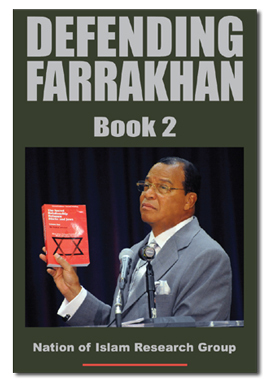 Thus the need for Defending Farrakhan, Book 2. Defending Farrakhan has become its own phenomenon. Fan pages are turning up on the Internet, in social media as well as blogs chronicling the contentious battle between Minister Farrakhan and influential but extremely intolerant groups within the racist Jewish community, such as the Anti-Defamation League of B’nai B’rith, the American Jewish Committee, and the Simon Wiesenthal Center. Although the title is bold and very clear, this book is not simply a defense of Minister Farrakhan. It is also a defense of the body of knowledge he represents as the chief exponent of the Teachings of the Most Honorable Elijah Muhammad, the patriarch and Eternal Leader of the Nation of Islam. In 416 pages you will experience 98 powerful articles by a new cadre of fearless and aggressive scholars who bluntly repel and defeat the defamatory attacks against Minister Farrakhan. Read as they expertly use history, science, culture, and religion to deliver bold, uncompromising written commentary. Drawing their weaponry from dusty archives, hidden historical documents, and the most current research, the writers confront the wicked charge of “anti-Semitism” with special fervor, blasting away at the false premises of American history and actually rewriting the history of the Black–Jewish relationship in the process. Absorbing, thought-provoking and compelling, Defending Farrakhan, Book 2, is a must-have for your library. This book presents another volume of essential information published in the award-winning influential independent weekly The Final Call, which has now entered into its 32nd year of publishing. It also contains never-before-published essays, seen here for the first time. The importance of independent Black media that are unafraid to publish the truth cannot be underestimated. The value of these writings will become more apparent as time passes and events transpire. Those within the Black community who know Minister Farrakhan beyond the insulting media caricature are finally telling their story, giving us a truer picture of the man and his value to Black people. Those who have benefited from his wise and patient counsel, experienced his generosity, and witnessed firsthand his consistent love of Black people see him clearly as a champion of the people and a defender of the weak and the downtrodden. He speaks for the voiceless as a courageous and steadfast advocate for the poor and oppressed people of the world. As I’ve written before, if you really want to destroy the enemies of truth, then respond to their slanderous mendacities with accurate data, actual facts, and with their own words. With the publication of Defending Farrakhan and numerous other books from the Nation of Islam Research Group, it is clear that now is the time to prepare to defend the one individual who has reliably and consistently stood in our defense. Get this book! Do your part! Read this book and inform others of its existence.